Ruth Galloway is content with life; she lives alone with her two cats in the desolate and bare area near Norfolk called the Saltmarsh. As a forensic archaeologist, she is fascinated by the land and marshes around her home that were sacred to the Iron Age inhabitants. Ruth spends her time on digs and teaching at the university, but her peaceful and serene world is shattered with DCI Harry Nelson asks Ruth for help. The bones of a child have been found a beach and Nelson thinks that they belong to Lucy Downey, a little girl who disappeared ten years ago. Ruth quickly determines that the bones are too old to be Lucy’s . . . about 2000 years too old. Nelson has been haunted by Lucy’s disappearance and has been tormented by strange letters that include references to the Bible, Shakespeare, and ancient rituals. As the letters are addressed directly to him, he is haunted by their accusations. 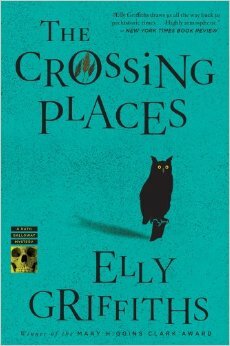 When another girl goes missing and the letters take on allusions to sacrifice and bones, Ruth is asked again to consult. Are the two missing girls linked in any way? What is the obsession to the Iron Age and ancient sites on the Saltmarsh? Ruth is reluctant to help, claiming her detective skills are better suited to the ancient past, until an attack is made that threatens Ruth and makes her question what she really knows about the people she is close to. I found this book when I was looking at Erin Hart’s Nora Gavin series about forensic pathology. Incidentally, Erin Hart made an author commentary on the back cover of this book. The two books are similar but it is fascinating how different pathology and archaeology can be. Elly Griffiths relies a little less on the technical aspects of pathology and more on the psychological analysis of human nature. I really enjoyed both book series. Ruth is a very likeable and human character. She is described as an “everywoman” who is intelligent and successful but also a bit naïve and self-conscious. She lives in an encapsulated world where she is in control and understands the workings of her environment. Her optimistic view of the world and its people is shattered by her involvement in the investigation, and the reader has to wonder how it will affect her future choices. I think both Erin Hart and Kathy Reich fans will enjoy the forensic plot but readers will not be overwhelmed by the technical details. I enjoyed how the past and present were woven together with both ancient and modern discoveries. Ruth is a very likeable character, but I did not like some of the secondary characters; not for the way they were written but rather for who they were. I am not sure how that will affect my view on future books in the series. I plan to read the next book and see what happens from there. This entry was posted in Book Series and tagged Elly Griffiths, England, Erin Hart, forensic archaeology, Kathy Reichs, mystery, Ruth Galloway, The Crossing Places on October 19, 2015 by kvgaughan.